Back in 1964, Robinson Crusoe on Mars was certainly a landmark of special effects, combining animation with elaborate sets and costumes. Hand-animated spaceships of course don't fly in today's cineplex, but as a piece of nostalgia, Robinson Crusoe on Mars fits the bill perfectly. 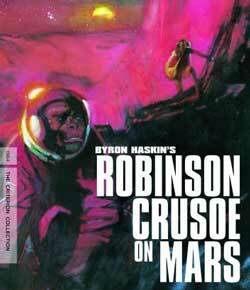 Robinson Crusoe on Mars is a latter-day retelling of the famous Daniel Dafoe novel, dropping Commander Kit Draper (Paul Mantee) on Martian soil with only a monkey as a companion. Turns out this Mars isn't terribly inhospitable. He only needs to take a breath of fresh air every hour or so and can get by without a helmet most of the time. Still, isolated from Earth, his tasks comprise the usual survival tactics in short order. He pulverizes rocks to make oxygen, then follows his monkey to a pond for water and food: the seaweed has Martian sausage growing inside it. Overall, not a bad little life he's got for himself. There's something rotten in the state of Denmark. It's Reptilicus. 1960s sci-fi was always a budget affair, and Planet of the Vampires is no exception to the rule. Directed by Mario Bava, who would later go on to fame as a master of the splatter genre, the vampires here are more like zombies who embody the minds of the hapless explorers who land on this otherwise desolate world, The Thing-style. Unfortunately, even Bava's camera tricks and boxum heroines can't save a plodding story and typically cheesy sets. The ending's a hoot, though.